Classic mission style furniture always brings both beauty and strength to any room. Let the Amish Franklin Mission Bar Stool become the featured seating at your kitchen bar or island and enjoy the popular mission design as part of your kitchen furniture collection. Bar stool seating brings family and friends to the counter for casual meals, snacks and work space. Sit in comfort on the Franklin with perfectly shaped and spaced back slats defining the chair back and stable solid wood stretchers providing room to rest your feet. The Franklin is available in a swivel bar stool or a dining chair option as well. These mission style bar chairs are handcrafted by skilled Amish craftsmen at their shop in northern Indiana. Each chair is hand sanded to ensure the smoothest finish. 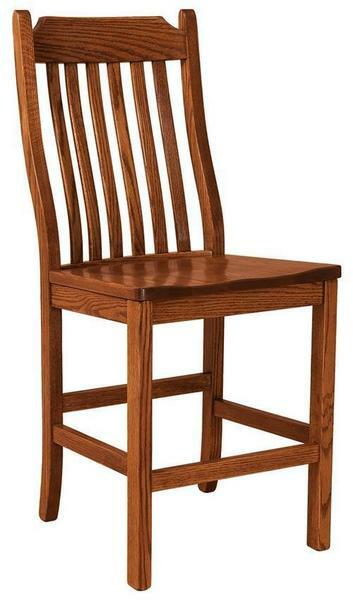 Browse more Amish made chairs from the LaGrange Collection and enjoy all the variety we have to offer. You've come to the right place for custom furniture. The Franklin is yours to design with the custom options you need for your home decor.